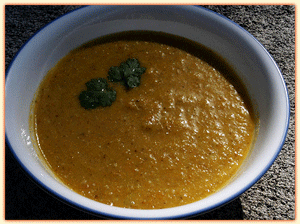 This soup is awesome. If you like things spicy, add some more chiles. Serves 4-6 for main course (add some nice bread!) Serves 8 for first course. 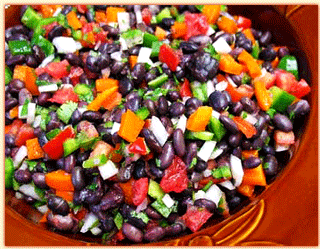 This is a great salad, full of fresh raw veggies and rich protein from the black beans. Can be a side dish or a light meal. This salad tastes better if it sits for a couple of hours in your refrigerator before serving. We have two big lemon verbena plants near the main house, and lots of smaller plants which have been propagated by cuttings throughout the forest. The smell of the leaves alone is a great reason to find a way to have it in your home garden – sweet, lemony goodness! We make tea with lemon verbena alone, but this combination of ingredients has become a favorite tea to sip on after meals. The jamaica (hibiscus, in English) is rich in vitamin C, the lemon verbena relieves stress, and the ginger aids digestion – making it the perfect after dinner drink. You can use cheese cloth as we do in this recipe, or you can simply strain the tea into a new pot. 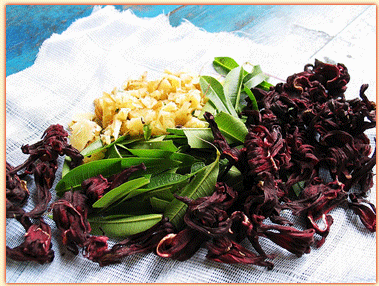 Combine herbs and fold into a cheesecloth – secure with string. Bring 6 cups of water to boil. Remove from heat, and add the bundle of herbs. Let steep for 5 minutes, remove herbs and serve! Offer honey if you desire, although I like this tea just the way it is – tart! This serves 6 people one cup of tea.